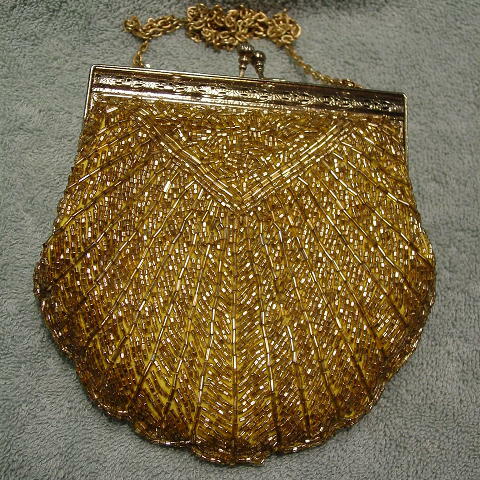 This vintage gold beaded evening bag has a canary yellow fabric base and matching lining. It has elongated beads in several sizes. There is a gold-tone metal rim with a cutout running design. The bottom of the lining has some black eyeliner marks. 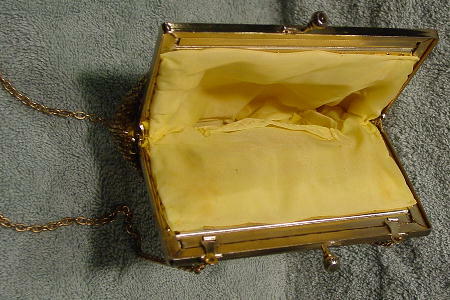 There is a gold-tone 35 1/2" long link chain which you can tuck inside and then carry as a clutch. It has a high bypass closure. Both sides have some missing beads. It's a very pretty rim.